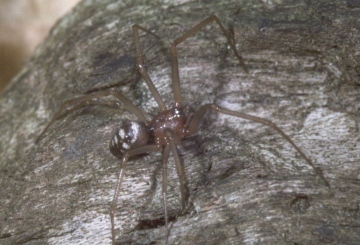 The spider is known from scattered locations across southern Britain becoming scarcer further north. It is widespread in western and central Europe, but not recorded from Norway. This spider is found most often in and around buildings but has also been taken in sheltered locations outdoors, e.g. in cracks in walls and on under-cliffs. The spider has been found in the sewer system in Leicester (J. Daws, pers. comm.). It constructs the scaffold webs typical of the genus and has been observed feeding on pill-woodlice Armadillidium. Adults have been found at most times of the year. The species was commonest in coastal areas of south-west England (Roberts 1995), but has increased in frequency in more recent years in the east and northwards.